Jim Clausen talks Wednesday as the minutes add up on the council chamber clock. It might be time for the Albany City Council to rethink the way it handles comments from the public during its regular meetings, which are held on two Wednesday nights a month at City Hall. Being open to public input is one thing. Prolonging meetings in order to accommodate long but irrelevant discourse is something else. This week, the council spent 18 agonizing minutes listening to two speakers. One rambled on for almost 10 minutes about various things, from a corner market run by people from India to the water supply in Keizer. She wound up by asking for an interview with a city official and the mayor offered to meet her for coffee. She was followed at the rostrum by Jim Clausen, a frequent presenter before the council and candidate for mayor in the last election. 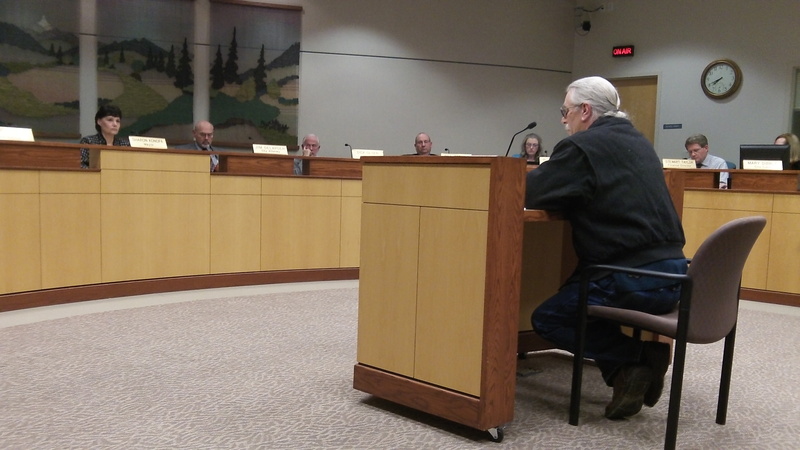 An applicant for appointment to a city advisory board had written he was interested in “social justice,” and Clausen regaled the council with quotations making the point that “social justice” is a meaningless term. Regardless of the merits of that point of view, is a council meeting the right place and time to bring it up? “Business from the public” is a useful agenda item because it gives citizens a chance to speak to the council, in public, with comments being recorded and even televised, on things the council should hear. Is there a problem in the neighborhood? Complaints about a city program? Parks that need attention? Questions about a development? Has a citizen been mistreated? Or have city workers gone out of their way to solve a problem? Those are the kinds of things the council should hear about. Jim, you’ve lost me with thinking council members and administrators should be limited to a similar time limit as the public. Their roles have no correlation and they are ELECTED to do a job. And all too often, that job is a thankless one. I am often critical of the council but it is not that I don’t appreciate the importance of their commitment to the community. I can fault none of them for that. The council must make decisions and exercise their judgement, and I don’t really care how long they must discuss an issue. My concern is they arrive at a decision they can defend and that serves the public to their best ability. Citizens speaking before the council have no such obligation. I’m sure you understand this. I wasn’t thinking of you when I made my previous remark but having said what you did, you have brought additional scrutiny upon yourself and the time you spend speaking before the council. You can’t have it both ways, my friend. That aside, when Jeff Christman was a councilor, I used to marvel at the mayor’s ability to obfuscate on any topic she didn’t like that Jeff brought up. I can recall a night when Jeff was asking some very reasonable questions about the transient tax money. He’d asked about the accountability of the monies and where they were going. In response, the mayor decided to give a history lesson on some irrelevant part of what Jeff had asked. Her story lasted for the better part of 10 minutes. Once she got done Wes Hare chimed in with a story of his own that was just as irrelevantly mind numbing, It too lasted the for the better part of 10 minutes. Neither the mayor nor Wes answered any part of Jeff’s questions in any way whatsoever. When Wes finished speaking Jeff shook his head, looked down at his paperwork, and decided not to pursue it further (he may have even forgotten what he asked by that time – lol). Fair enough Jim. However, tongue in cheek, sarcasm, etc. don’t translate well in print….usually. Just saying. “Business from the public” should concern the public…..not a forum to air ongoing personal views or complaints about specific businesses. Public business means just that….. I do not attend city council meetings but I watch them online on the city website. I agree with Hasso on this point, as I often agree with the presenters, but I don’t think, at times, that city council meetings are the appropriate venue for the “complaints” I often see and hear presented. We have important issues that do need our attention and they should be the priority. How we arrive at that result is the question. A 3 minute time limit sounds reasonable to me.